We are also open at Easter from Fri-Sun! Peurasuvanto Holiday Village is located on the Northern side of Sodankylä just next to the Kitinen river and offers coffee & restaurant services together with cosy cottage accommodation just in the middle of pure nature in Lapland. In Peurasuvanto Holiday village you will find 12 different size cottages, one larger ”house” cottage, as well as a café restaurant building. In the smaller cottages you will find WC facilities and in larger ones shower facilities. In some of the cottages, you will find your own sauna. Every cottage is equipped with a kitchen and a flatscreen TV. You will find Wi-Fi connection in the café. Located in the middle of the village, you have common sauna and shower facilities and a laundry room. Firewood is available for all clients and a small Lappish hut is open for everyone just next to the Kitinen River. Peurasuvanto Holiday Village offers great facilities for fishing, ice fishing, driving snowmobiles, berry & mushroom picking or simply for all nature lovers! NB! You can also book a place for your trailer or camping car at our Holiday Village for 30€ / night, read more on book now. If you start feeling hungry, stop and enjoy a tasty meal or a cup of coffee with a fresh pastry at our café! Book your cottage fast and effortlessly for your next city escape. You have the lowest price guarantee on our website! Get to know the activities proposed in the area, as there is choice both for winter and summer! 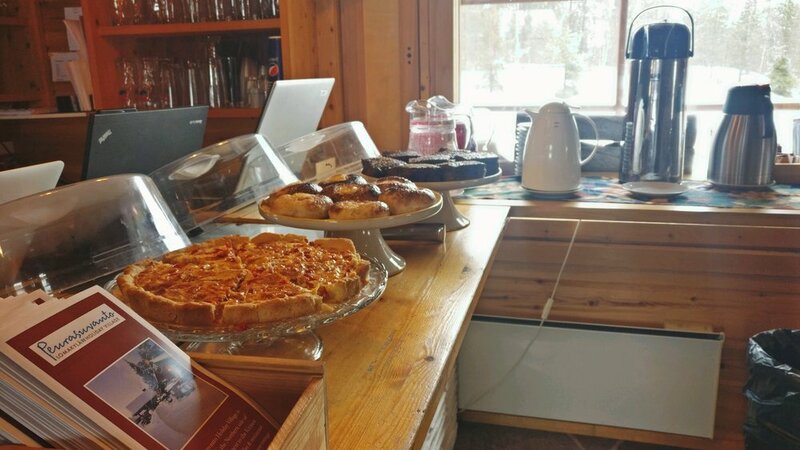 Welcome for a coffee break or a small bite to eat in our café-restaurant located just beside the road E75 taking you to the Northest point of Finland. At summer we are open daily and at winter during weekends. At our café you can by both hot and cold drinks with homemade salty and sweet pastries and enjoy them on our sunny terrace. You will also find some souvenirs and ice-cream in our selection. Our café serves light alcoholic beverages. As a new treat, we now offer Peurasuvanto’s Reindeer Stew for 9,90€, as well as pancakes & coffee for 3€! At the moment this is the largest cottage in our selection, as it includes 3 bedrooms and 8 beds. You will find your own kitchen and dining area, as well as a shower and bathroom in the cottage. A common wood sauna is available just a few meters away for when it starts to get really cold! In the cottages in this category you will find a wood heated sauna in addition to shower and bathroom facilities. You also have a common living room, in which you will find the bedding, a kitchen and a dining space, which created a cosy ensemble. In the cottages in this category you will find a shower and bathroom facilities. You also have a common living room, in which you will find the bedding, a kitchen and a dining space, which created a cosy ensemble. Book effortlessly directly from us and you get the lowest price guarantee! NB! You can also book your trailer / camping car place for 30€ / night, including electricity, water as well as the use of the common shower and sauna facilities! Simply click on the "cottage" menu and choose "trailer / camping car" while making your booking. Veloitamme 15€ lemmikkimaksun per lemmikki majoituksenne ajalta. Thank You for Your booking! We will shortly send you a confirmation via e-mail. See you soon! Contact us effortlessly by filling in the sheet below or give feedback on your experience!